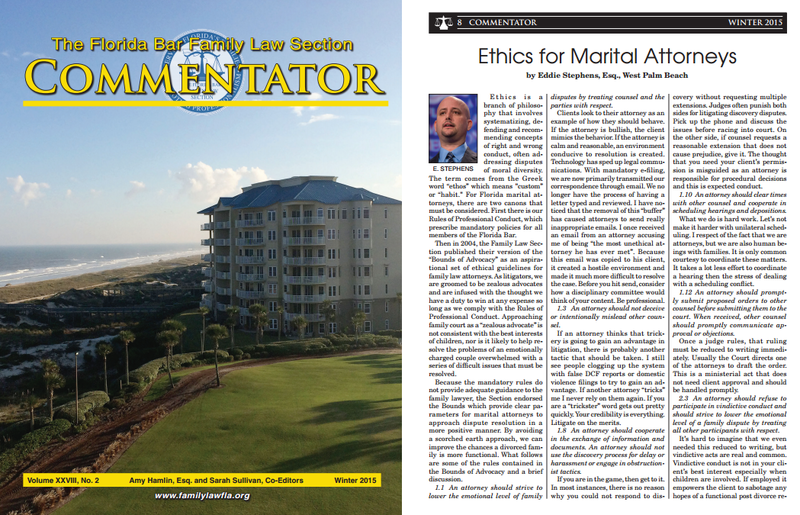 Originally published in the Family Law Commentator. Ethics is a branch of philosophy that involves systematizing, defending and recommending concepts of right and wrong conduct, often addressing disputes of moral diversity. The term comes from the Greek word “ethos” which means “custom” or “habit”. For Florida marital attorneys, there are two canons that must be considered. First there is our Rules of Professional Conduct, which prescribe mandatory policies for all members of the Florida Bar. Then in 2004, the Family Law Section published their version of the “Bounds of Advocacy” as an aspirational set of ethical guidelines for family law attorneys. As litigators, we are groomed to be zealous advocates and are infused with the thought we have a duty to win at any expense so long as we comply with the Rules of Professional Conduct. Approaching family court as a “zealous advocate” is not consistent with the best interests of children, nor is it likely to help resolve the problems of an emotionally charged couple overwhelmed with a series of difficult issues that must be resolved. Because the mandatory rules do not provide adequate guidance to the family lawyer, the section endorsed the Bounds. This provides clear parameters for marital attorneys to approach dispute resolution in a more positive manner. By avoiding a scorched earth approach, we can improve the chances a divorced family is more functional. What follows are some of the rules contained in the Bounds of Advocacy and a brief discussion. 1.1 An attorney should strive to lower the emotional level of family disputes by treating counsel and the parties with respect. Clients look to their attorney as an example of how they should behave. If the attorney is bullish, the client mimics the behavior. If the attorney is calm and reasonable, an environment conducive to resolution is created. Technology has sped up legal communications. With mandatory e-filing, we are now primarily transmitted our correspondence through email. We no longer have the process of having a letter typed and reviewed. I have noticed that the removal of this “buffer” has caused attorneys to send really inappropriate emails. I once received an email from an attorney accusing me of being “the most unethical attorney he has ever met”. Because this email was copied to his client, it created a hostile environment and made it much more difficult to resolve the case. Before you hit send, consider how a disciplinary committee would think of your content. Be professional. 1.3 An attorney should not deceive or intentionally mislead other counsel. If an attorney thinks that trickery is going to gain an advantage in litigation, there is probably another tactic that should be taken. I still see people clogging up the system with false DCF reports or domestic violence filings to try to gain an advantage. If another attorney “tricks” me I never rely on them again. If you are a “trickster” word gets out pretty quickly. Your credibility is everything. Litigate on the merits. 1.8 An attorney should cooperate in the exchange of information and documents. An attorney should not use the discovery process for delay or harassment or engage in obstructionist tactics. If you are in the game, then get to it. In most instances, there is no reason why you could not respond to discovery without requesting multiple extensions. Judges often punish both sides for litigating discovery disputes. Pick up the phone and discuss the issues before racing into court. On the other side, if counsel requests a reasonable extension that does not cause prejudice, give it. The thought that you need your client’s permission is misguided as an attorney is responsible for procedural decisions and this is expected conduct. 1.10 An attorney should clear times with other counsel and cooperate in scheduling hearings and depositions. What we do is hard work. Let’s not make it harder with unilateral scheduling. I respect of the fact that we are attorneys, but we are also human beings with families. It is only common courtesy to coordinate these matters. It takes a lot less effort to coordinate a hearing then the stress of dealing with a scheduling conflict. 1.12 An attorney should promptly submit proposed orders to other counsel before submitting them to the court. When received, other counsel should promptly communicate approval or objections. Once a judge rules, that ruling must be reduced to writing immediately. Usually the Court directs one of the attorneys to draft the order. This is a ministerial act that does not need client approval and should be handled promptly. 2.3 An attorney should refuse to participate in vindictive conduct and should strive to lower the emotional level of a family dispute by treating all other participants with respect. Its hard to imagine that we even needed this reduced to writing, but vindictive acts are real and common. Vindictive conduct is not in your client’s best interest especially when children are involved. If employed it empowers the client to sabotage any hopes of a functional post divorce relationship with the other parent and invites retaliation. 3.2 An attorney must provide sufficient information to permit the client to make informed decisions. The fundamental purpose of a family attorney is to counsel; to provide advice on the issues to be decided. This often means you must educate the client so they can appreciate the decision and then provide the pros and cons so the client can make a meaningful decision. 3.5 When the client’s decision making ability appears to be impaired, the attorney should try to protect the client from the harmful effects of the impairment. Family law actions are among the most stressful events that will ever happen to a person. If you have a client who is high stress under the best of circumstances, you could end up with a client with impaired decision making. Add the financial and emotional stress attendant to the process often leads to clouded vision. When this happens, you have a duty to protect your client from the “harmful effects” of their impairment. This usually occurs when a client is close to major event – depositions, temporary relief, trial, signing an agreement. If your client is truly impaired and unable to participate in a meaningful manner, stop everything and get your client to the appropriate mental health professional, suggest therapy or even just a weekend “off” from the proceedings. 3.7 An attorney should not allow personal, moral, or religious beliefs to diminish loyalty to the client or usurp the client’s right to make decisions concerning the objectives of representation. If your beliefs interfere, don’t take the case. If you take an emotionally charged case make sure that you do not allow your own personal beliefs to guide your legal representation. 3.8 An attorney should discourage the client from interfering in the other party’s effort to obtain counsel of choice. This is not the Sopranos. 7.1 An attorney representing a parent should consider the welfare of the minor children and seek to minimize the adverse impact of the family law litigation on them. Include in your guidance a consideration of the best interest of the kids in giving your advice. If your client is not equipped for 50/50 timesharing, don’t go for it just to reduce a child support obligation. The above is just a sampling of all the “Bounds”. I encourage you to download the entire text, including commentary, of the Bounds of Advocacy. What is always gets to court before you? Your reputation. Excellent information and commentary. It’s baffling to see how many attorneys refuse to acknowledge ethics and instead compromise the long term environment of children for the sake of “winning” or increasing their odds of “winning” a case.